Welcome to our Roald Dahl Day Blog Hop. To continue on to the next blog, scroll down to the end of this post and click on the button. 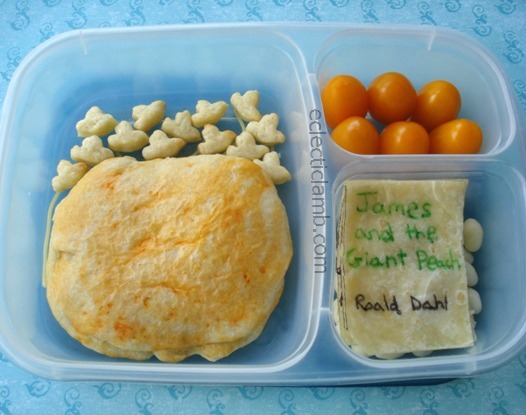 When I found out that my Bento Bloggers and Friends planned to hold a Roald Dahl Bento Hop, my first thought was James and the Giant Peach. I have vivid memories of my 1st grade teacher reading the book to my class. I did not see the movie because I did not want anything to compete with my childhood memories of this story. This lunch is very simple but it is how I would have drawn it as a child. It portrays the seagulls carrying the peach in the sky. You can imagine what is inside the peach. That was my favorite part as a child, thinking about James, Centipede, Miss Spider, Old-Green-Grasshopper, Ladybug, and Earthworm interacting inside a peach. Please click on the hop button below to see what Sarah of Blame it on the bento prepared. This entry was posted in Bento / Cute Food, Food and tagged bento, blog hop, lunch. Bookmark the permalink. Cute! Your pizza peach looks yummy! Awesome!!! I love the seagulls, and the peach looks super tasty and gorgeous!!! Great lunch! James and the giant peach is my favorite! This is a great lunch, and how smart to not watch the movie. So often, movies ‘ruin’ our images of the true story! Thank you! If I love a book I tend to not watch the movie. I like your piecrust sea gulls! Very creative! Pizza peach??? You are a genius!! Your lunch is adorable, too! I love your pizza peach and seagulls. They look just like the book illustrations to me! I love your pizza peach and seagulls. They look just like the book illustrations! I love this part in the book when James comes up with the idea of letting the seagulls carry them off. I adore your pizza peach and love that you chose this part of the story! Its lovely! I loved the book too as a child! Thank you so much Winnie! I love the birds!! Genius! Thank you so much Keith!